Extreme couponing used to take forever to do. Not anymore with using coupon apps. Even when you're not couponing to the extreme, these coupon apps can help you save so much money and make money too without spending too much time and effort. … that person who flips newspapers, goes through coupon inserts, search the web for savings, etc. I know you can agree with me when I say that couponing takes forever to perfect or to even try. For those with “full-time” jobs, using coupon apps (that can do everything you need to do) is just as important and valuable. If you type the word “coupon” on your smartphone, you'll see hundreds if not thousands of coupon apps. If it isn't confusing enough, a lot of these apps will offer the same features with minor differences with each other. The most functional and helpful ones are hard to find… until now! Here are the 13 best coupon apps of 2019. Grocery bills are no joke. But there's a solution to that. Ibotta is my favorite coupon app by far. As of this writing, Ibotta has given over $450 MILLION to its members. That's with an M.
It helps you save money on just about anywhere you make a purchase. You get cash back on offers at hundreds of grocery stores. Do you buy bread? Canned goods? Produce? Book a hotel? You get cash back on just about everything. In addition, earn more with your friends with the monthly team bonuses. It's easy to save money from Ibotta that I was able to save over $300 in just a few months (even when I didn't do a whole lot). You'll get $10 welcome bonus when you sign up using my link below. Yes, you earn cash right away. Here's how it works: Browse the library of deals in Ibotta for specific items you want to buy. Buy those items. Take them home, take a picture of your receipt or of the barcode, and redeem the offer(s). That's it. Click here to sign up for Ibotta and use it for FREE. Dosh isn't your typical coupon app. Actually, it is a cash back app that goes straight to getting you rebates. You don't need to scan the barcodes, use store coupons, take photos, or even look for coupon codes to get the savings. Who doesn't want that, right? Dosh has been in the news lately for good reasons. Recently, it received an additional $40M funding from investors – a signal of how great of a product Dosh is. Here's how it works: Link your debit card (not credit card) to the app. Dosh will watch what you purchase and if a product is eligible to earn cash back, then, it will work on its background to get you that. How's this for instant savings? You go to a store and get rewarded right away. Yes, that's how Shopkick works. You will get points when you visit your favorite stores even when you don't make a purchase. You can't the say thing with other coupon apps. Shopkick is also a deals app. It alerts you of deals and coupons when you work into the store. Unlike other apps, you can use Shopkick on just about any retailers. You can also take surveys, share socially, etc. and earn points in return. Once you earn enough points, you can redeem them for gift cards. It's that easy. Here's how it works: Step into the store for points. Scan specific items that are in the app to get additional points. That's it. Click here to use Shopkick for FREE. 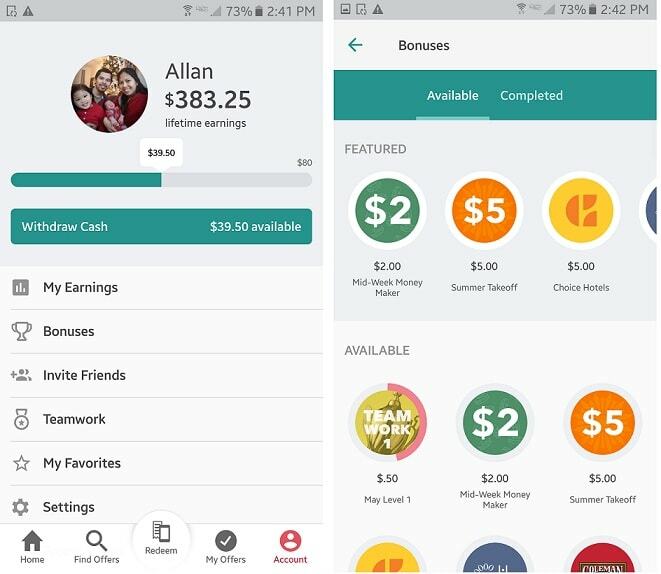 Not necessarily a coupon app, Ebates is an app that gives you cash back for your purchases. If you've purchased anything online, chances are you've searched everywhere to get a discount. That's a thing of the past with Ebates. Use it when you shop at any of its partner stores, and you're bound to make up to 40% in cash back. You can also use the Chrome extension for Ebates to make sure you never miss any cash back ever again. Here's how it works: Go to Ebates to find your favorite store, click the store, and get redirected to it. That's it. The cash back will appear in your account a couple of days after you finished the purchase. Alternatively, just activate the extension and let Ebates remind when the store is a partner where you can get cash back. Before there were Living Social and other deals app, there's Groupon. By a mile, it's still one of the best deals apps out there. Most Groupon coupons come in deals where you only pay a discounted rate for a specific product or service. Last year, I bought a peacoat that was originally priced at $200 for $30 only. One thing you need to be aware of, that is, Groupon deals do expire and the promotional values do expire as well. That said, once they expire, don't worry because you can still redeem for the cash value you paid. Here's how it works: You search for the service or product you want, pay for it, and that's it. You get the product or service for a (sometimes) steep discount. SavingStar pushes the ease of saving money even further. You don't need to clip coupons, add coupons, use store coupons, and find specific grocery stores for specific items. Almost any of the products in its system can be bought on any stores. You don't need to bring your smartphone to get the cash back. It's all about putting your loyalty store cards to use. Here's how it works: (1) Link your store card; (2) Choose your rebates; (3) Use your store card at checkout, and; (4) Get your savings automatically deposited in your SavingStar account. It's that simple. With SavingStar, you can say goodbye to high grocery bills. Once you accumulate $20, withdraw the money and deposit it to your bank account or PayPal account. You can even donate it to charity. Click here to start using SavingStar for FREE. The app's name sounds sweet because it is. Honey helps you find those high-value coupons without you going through hoops and loops to find them. Just download the Honey app browser extension. Each time you make a purchase, Honey will search through the best digital coupons on the web right in the site where you're shopping on. It will automatically apply the coupon in your shopping cart without you even lifting a single finger. With Honey, you don't need store coupons. Yeah, I can hear what you're saying. Yes, it's magic. Here's how it works: Honey will search the world wide web for coupons and it will use the highest value coupon and enter it automatically in your cart. If there's none, then, nothing will be displayed. Click here to use Honey for FREE. If you're not into couponing, which many people aren't, then Checkout 51 is your next best app. Like Ibotta, you will get cash back for purchases of products found in the app. Here's a lesson: Never go on a shopping trip without looking into your Checkout 51 app. Checkout 51 lets you save money and time money by not pushing you to clip coupons, spend time finding those coupons, etc. Here's how it works: Just go your normal day of shopping. When you get home, take a picture of your receipt using the app. If you bought a product that's in its app, you'll get cash back, which will be deposited in your Checkout 51 account. Once you earn cash or accumulate $20 or more, you can have a check sent to you. That's it. Click here to use Checkout 51 for FREE. You'll see extreme couponers even the novice ones carry coupon binders or a coupon book and go through each page to see if they have a coupon for specific items. SnipSnap feels their pain, and that's why it created a coupon app called SnipSnap. SnipSnap is unlike any other coupon apps you've used before. Here's how it works: You just literally take a pic of the product, and it will list promotions, sales, and coupons for that specific item. It will even tell you if it's cheaper to buy it online or in-store. It doesn't get any easier and better than that. Going for a shopping trip? I bet there's a Walmart near you. Walmart is everywhere, and this time, for a good reason. If you've ever priced-match on Walmart because you saw another store with a lower price on products, then, Walmart Savings Catcher is for you. As you know, Walmart no longer does price matches, but its app does. Here's how it works: When Walmart Saving Catcher finds another store that has lower prices for the same products you bought, then, you'll get the difference. RetailMeNot is one of the oldest but one of the best coupon apps ever. If you are looking for any type of coupon for online purchases or need to use printable coupons, chances are there are multiple coupons on RetailMeNot for whatever you want to buy. Here's how it works: Just go to RetailMeNot and type it the store you want to make purchases from. RetailMeNot will, then, list all the available coupons. Yes, yes, yes, I can hear what you're saying right now. Isn't it just another app for groceries? Actually, it is. You can literally make money from what you buy when you use Receipt Hog, Ibotta, and Checkout 51 together. Why? It's because you can literally get rebates for the same item. Who doesn't want that? One time, I got over $20 in rebates for a $5 product. That's $15 in profit not to mention I got to use the product. If you've got a smartphone, why not include another coupon app like Receipt Hog to earn extra money. Here how it works: Browse the library of deals in Receipt Hog for specific items you want to buy. Buy those items. Take them home, take a picture of the barcode, and redeem the offer(s). That's it. 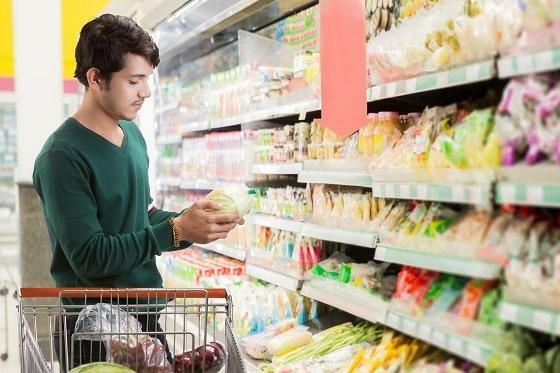 If you want to make sure everyone in your family is on the same page as you are when it comes to grocery shopping or shopping list, then, Grocery IQ is for you. This coupon app is very intuitive and user-friendly. It allows you to build a shopping list, search and view coupons, and add store's loyalty card. It can also sync your list with anybody you choose. That's where you can get people to be on the same page with you on a grocery shopping level. Here's how it works: Add items to your ‘Favorites' just by clicking “+” from the favorites tab. When you go to the store, check items off the list by tapping on the items to keep you on track of what you've placed in your cart. Once you press “Checkout”, the items will be checked off the list and will be moved to the ‘History'. Those left in your ‘Favorites' are the ones you haven't bought. Prescription drug costs are no joke. How do you know you're paying a little or too much for your prescriptions? Fortunately, there's an app that does that. The app is simple and very straightforward. It will show you the pharmacies in your area that carries your prescription. It will tell you how cheap or expensive it is. In addition, there are times that this app offers extra printable coupons you can use. That's savings right there. Here's how it works: Just open the app and get connected to the internet. Punch in the prescription and GoodRx will find the pharmacies near you and the cost of that prescription. That's it. Whether you want to save money, save time, make money, or any combination, coupon apps can definitely help you with that. Coupon apps are very useful especially when you are short of time and/or always on the go but still need to do your shopping. Never go on a shopping trip without these coupon apps. A simple coupon app can make a big difference. Which of these coupon apps are you going to use right away? Do you like printable coupons or the new way of using and getting coupons? Do you think these coupon apps are useful to your everyday living?